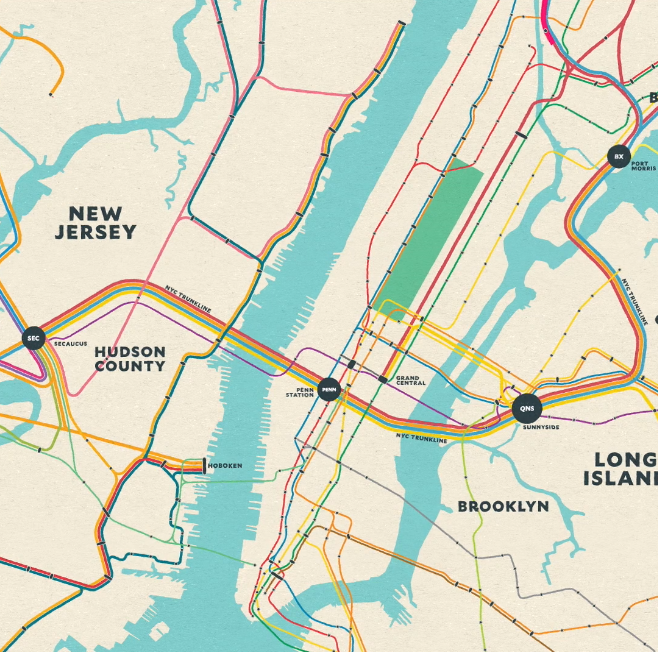 ReThink Studio develops transit improvement proposals for urban regions. First, we study the history and evolution of the issue, interrogating all the underlying assumptions. Next, we design a system that works better. Then we produce materials to support our design, inform the public, and convince stakeholders to sign on. Finally, our implementation strategies help move our projects off the drawing board and into the real world. 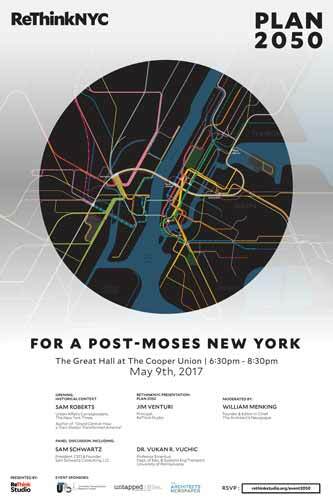 ReThink Studio’s methodology is best exemplified by ReThinkNYC, our critically acclaimed proposal to establish a regional mass transit network for the greater New York City area. Our ReThinkNYC plan is built on comprehensive knowledge of the current transit system and a deep understanding of the opportunities for improvement. The result: a thorough and far‐reaching plan for unifying New York’s regional rail system that would revolutionize the way people move through the city and the growth patterns of the region for decades to come. Our planning and design experience enables us to look at other urban areas with similar insight, whether we are working with municipalities or developers looking for clever, cost‐effective ways to improve their offerings, increase the value of existing projects, or integrate with current transportation systems. We approach all design challenges, both large and small, with similar depth and insight. Whether we are working with municipalities, nonprofits, or developers. We always look for clever, cost‐effective ways to improve our clients’ offerings, increase the value of existing projects, and integrate with current transportation systems. ReThink Studio creates videos, animations, and graphics that convey the power and elegance of our design solutions. Our images can both open and change minds, and they are as effective with the general public as they are with industry insiders. Taking a multi‐faceted, complex project and translating it into an easily understood visual narrative provides more credibility for any plan, no matter the scale. Talk to us about how we could elevate your project by producing animations, renderings, maps, or a combination of these things. 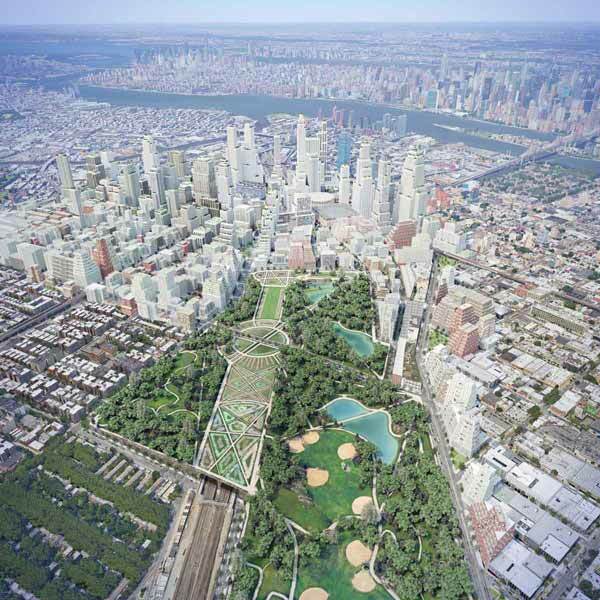 ReThink Studio has an extensive network of partners and contacts within the urban planning and architecture communities. We know how to shepherd our plans through the maze of private, public, and nonprofit organizations that regulate and fund infrastructure. We know how to court and win public support. And we know how to get media attention for our projects. We did all these things successfully for ReThinkNYC and now we offer these services to you too. Our outreach strategies are tailored to your needs and designed to reach the ideal target audience. The services we provide include: staging events, conducting media interviews, creating renderings and videos, producing booklets, and launching social media campaigns. No matter the scope of the project, our focus is entirely on bringing it to fruition. For some, that may mean gathering support from industry experts or working with similar agencies. Other plans may focus on garnering public and media attention.